For centuries, Christianity was strictly forbidden in Japan. Japanese citizens were required to express their renunciation of Christianity by stepping on fumi-e, carved images of Jesus and Mary. Those who refused were subjected to painful tortures. This practice, depicted in Shūsaku Endō’s acclaimed novel Silence, began in the 17th century and continued into the 19th century, right into the beginning of the Meiji era. Kiku’s Prayer, an Endo novel first published in serialized form in 1980 and 1981 and newly translated into English by Van C. Gessel, tells of the once hidden Christians (or Kakure Kirishitans) at the dawn of the Meiji era. The novel opens with the story of two young girls, Mitsu and Kiku, who live in a village outside Nagasaki. Mitsu is obliging and obedient to her elders, and Kiku is an adventurous tomboy. Kiku’s kind-hearted and risk-taking ways get her in trouble sometimes—early in the novel she gets stuck in a tree trying to rescue a kitten, having been goaded into the act by a couple of local boys. But a young man from nearby Nakano rescues her. Despite being told that people from Nakano are no-good Kuros, a term Kiku doesn’t understand, she never forgets the young man who helped her. That early encounter ends up shaping the course of her life. Meanwhile a French priest named Bernard Petitjean arrives in Nagasaki to assist in the building and maintaining of the Ōura Church, which was being built to serve the Westerners who were newly allowed in Japan as trading partners. Father Petitjean longed to find some of the Japanese Christians who had continued in the faith despite the law, but the rules were clear. The new Christian church was for Westerners only. No Japanese were to be allowed to worship there. This novel serves as something of a follow-up to Silence, although it lacks the intimacy of the earlier novel. 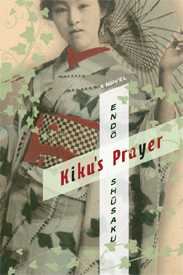 Here, instead of delving deeply into the mind of a single Christian, Endō splits the narrative between Kiku as she grows into an adult woman, Petitjean as he figures out how to help the Japanese Christians, and the Japanese Christians themselves as they come out of hiding and find persecution and pain almost beyond imagining. We also see into the mind of one of the men involved in the persecution. It’s more of a widescreen view of the era and the ways the changing attitudes toward the West affected people of different walks of life. For me, the different approach took away some of the novel’s power, but not to a great degree—I still found this novel moving and thought-provoking. 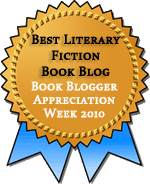 A comparison to Silence is almost unfair because the earlier novel knocked me flat and changed my thinking. Kiku’s Prayer covers enough similar ground that its effect is more limited. Probably the most difficult idea presented here is that of the value and meaning of suffering and the role of prayer in suffering. Characters pray and God is silent. Simplistic notions about answered prayer just don’t hold up here. Prayer, instead, is about finding strength in suffering, rather than being delivered from it. Yet the priests and Christians still sometimes offer simplistic teachings—the tension here is not followed up on, and the questions linger. Whether that’s a good thing depends on the reader, I think, I appreciated the tension. For me, the difference between what characters said and what they experienced reflected real life, and attempts to explain it would tip the novel too far into preachy territory. More problematic is the attempt to make suffering meaningful. Much of my struggle here has to do with the way Endō uses Kiku herself. When Kiku falls in love, her love seems almost too intense, given her limited knowledge of the man she loves, but she throws herself into that love with a single-minded devotion that leads her onto a path she never would have chosen were it not out of love. Just as in Silence Endō redefines what it means to have faith, here he redefines what it means to be pure. But the story becomes difficult for me to swallow when Kiku’s journey is turned into a means for softening the heart of one of the men who knows her. I can’t deny that I was moved by this development, but I was uncomfortable about the way Kiku’s particularly feminine pain becomes a tool for a man’s conversion. It comes perilously close to certain damaging readings of the Bible in which women are encouraged to endure abuse as some sort of testimony. Had the novel ended earlier, without the too-tidy resolution, I would have been less troubled, but the more Endō attempts to extract meaning from Kiku’s suffering, the more it feels like a plot device. Her part of the story ceases to belong to her but to the men around her. Even though I had problems with parts of the narrative, I found the bulk of the novel to be effective and unsettling in the right ways. I was especially interested to learn more about the hidden Christians. Endō incorporates actual historical figures into the story. Petitjean, for example, was really a priest in Nagasaki. And from what I’ve been able to find out, much of the persecution he describes was real. The opening of Japan to the West changed the country forever, but the transition was rocky, and Endō shows just how rocky it was for many. This book happened to come to me at just the right time for Tony’s January in Japan event. If you’re interested in more Japanese lit, check out the event blog. I was interested to see this review as I have a copy of this book waiting for me. I’m unfamiliar with Japanese literature and I haven’t read Silence, but I’m hoping I’ll still be able to take something from it. I think you will be able to get something out of it. The historical and cultural situation are explained quite well, and it follows up on Silence only in the sense that it’s set in the same place years later. Not at all surprised the book would have those kind of sexist undertones in the storytelling, though, obviously it’s unfortunate. Yeah, it is a shame. It doesn’t keep it from being worth reading, IMO, but I wish Kiku’s pain had been handled just a little differently. I am trying to remember the name of a book that I read with a similar them a couple years ago. Hmm, it will come to me. Probably in the middle of the night :-). Happens to me all the time. And then I can’t remember why I was trying to remember the thing I couldn’t remember! I’ve enjoyed all the Endo books I’ve tried so far, and this sounds like another good one. My next review will be on ‘Volcano’, one with a more contemporary setting but still with some Catholic themes. He seemed to enjoy writing about characters with severe doubts about their faith, and wondering whether Christianity was even possible in the foreign soil of Japan. Besides Silence, the only other book I’ve read of his was Deep River, which I liked but not as much as I did the other two. I’m definitely going to read more; I think the ideas he pursues are really difficult but in a satisfying way. I’m currently reading Silence which I’m finding both provocative and beautifully written. I don’t think I’ve really come across a novel dealing with faith in quite this way and it’s really made me ponder what it means to believe. I’m definitely going to try this one too. My favourite novel by Endo is still The Samurai so I hope you try that too. I’ve read a lot of books about faith but few that approached Silence in its impact on me. This book is very much in the same vein but I don’t think the ideas in it are nearly as complex. I’ve had The Samurai on my list for a while–on your recommendation, I think! Ooh, I can’t wait to read this. Thank you so much for your review. Silence affected me profoundly too. I hope you enjoy it. Despite its flaws, it has a lot to offer.